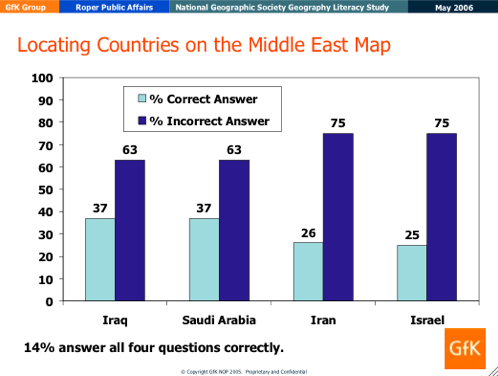 With all the talk of Iran and Israel among the GOP presidential candidates, it is worth remembering that in this poll of a few years ago, three quarters of Americans could find neither Israel nor Iran on a map. Despite the US being at that time the occupying power in Iraq, some two-thirds couldn’t recognize that one, either. I suggest a new regulation on war. If a majority of your country cannot find the enemy country on the map, they aren’t interested enough to justify making war against it.